A post by Kate Keator – Bradford Rotary Peace Fellow 2017-18, class XVI. On the first day we visited the Norwegian Ministry of Foreign Affairs and met with Mr. Espen Lindbaeck, Deputy Director to learn more about the Norwegian government’s policies and efforts towards achieving Peace and Reconciliation in countries like Colombia, Guatemala and the Philippines and how they build their international relations on this matter. Later that day the two classes of Fellows went to the Norwegian Institute of International Affairs (NUPI) where Dr. Cedric de Coning, Senior Research Fellow, explained the different areas of research the Institute is working on such as War and Peace, Economy and Development, and Diplomacy and Global Governance. He also highlighted their research on the United Nations’ Peacekeeping Operations and how they build relationships with policymakers to ensure that their research has impact. The Fellows’ second day in Oslo took us first to the Peace Research Institute Oslo (PRIO) where Research Professor Halvard Buhaug gave a history of PRIO and its strong academic standing in the peace research community before diving into the question of the connection between environmental change and conflict. He was followed by his colleague, Research Professor Marta Bivand Erdal, who presented her findings concerning the concept of migration and the powerful role this plays in global trade and security policy. Many of the Bradford and Uppsala Fellows had explored these above ideas in their classes and had plenty to say during the discussion that followed the presentations! 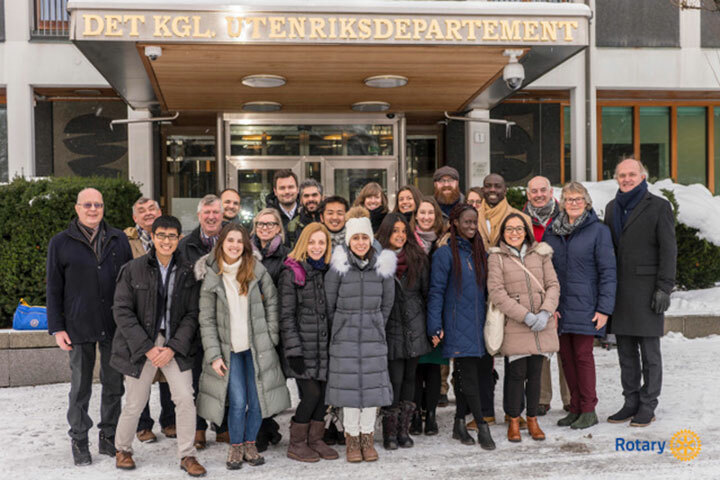 The trip ended with a truly insightful visit to the Norwegian Nobel Institute, where we were greeted by the Director of the Research Consultants who compile the thorough background papers on Nobel Peace Prize candidates which is then provided to the Norwegian Nobel Committee. He took us to the ceremonial room where the Nobel Peace Prize was presented for many years, and gave us the biography of the Institute’s namesake, Alfred Nobel. He also shared instances of formative experiences the committee faced over the years that helped elevate the Nobel Peace Prize to the status it maintains today. He also showed the Fellows the room where the Committee deliberates, and candidly answered our questions about the Institute’s influence and his interactions with Nobel Peace Laureates.